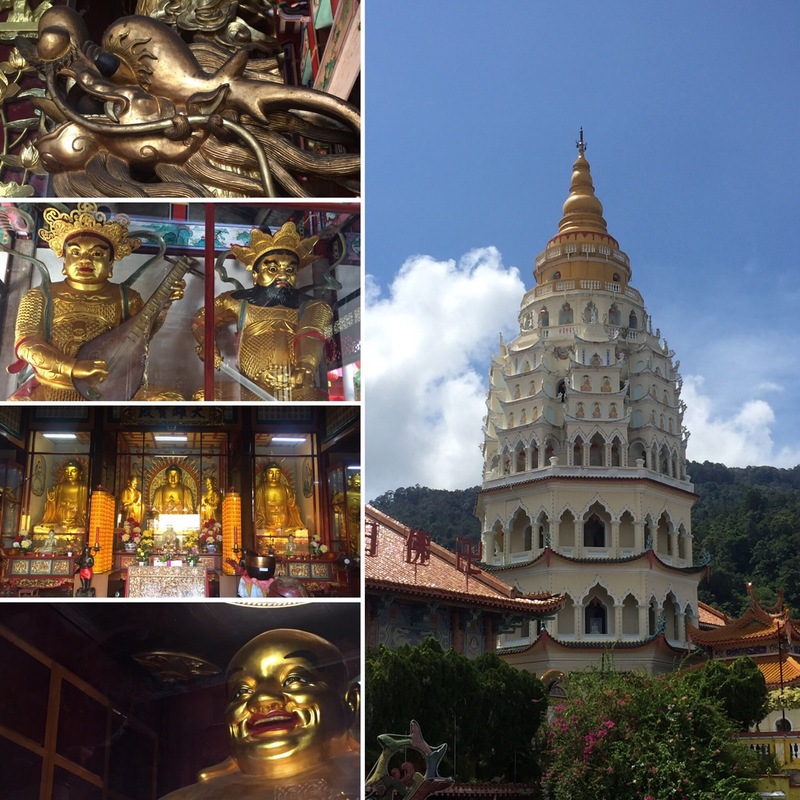 On the 22nd October, we headed to the famous Malaysian island of Penang. 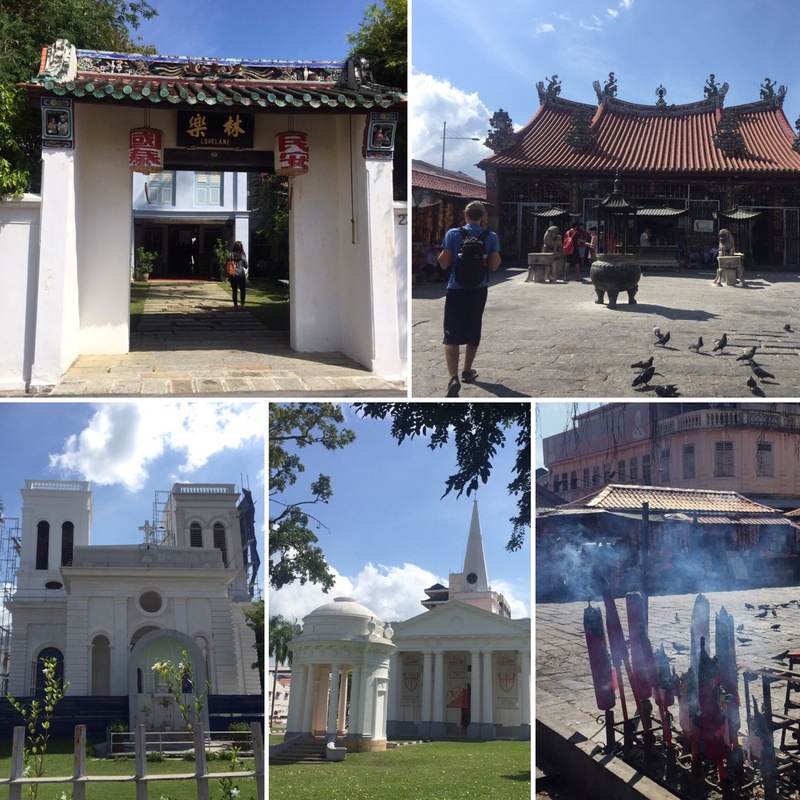 This is often nicknamed the Pearl of the Orient as it’s full of different cultures and hidden gems to see. 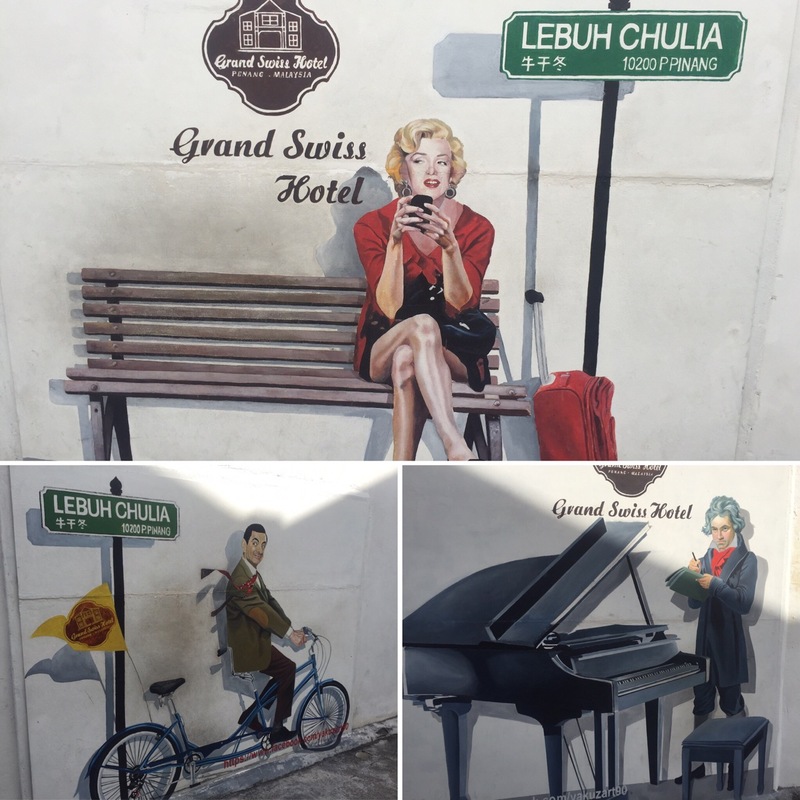 We stayed in the main city in Penang called Georgetown. Georgetown mainly focusses around its Old Town which is likely where you would stay (particularly if you’re staying in a hostel) – we stayed just off a famous street called Love Lane which is filled with bars and cafés. 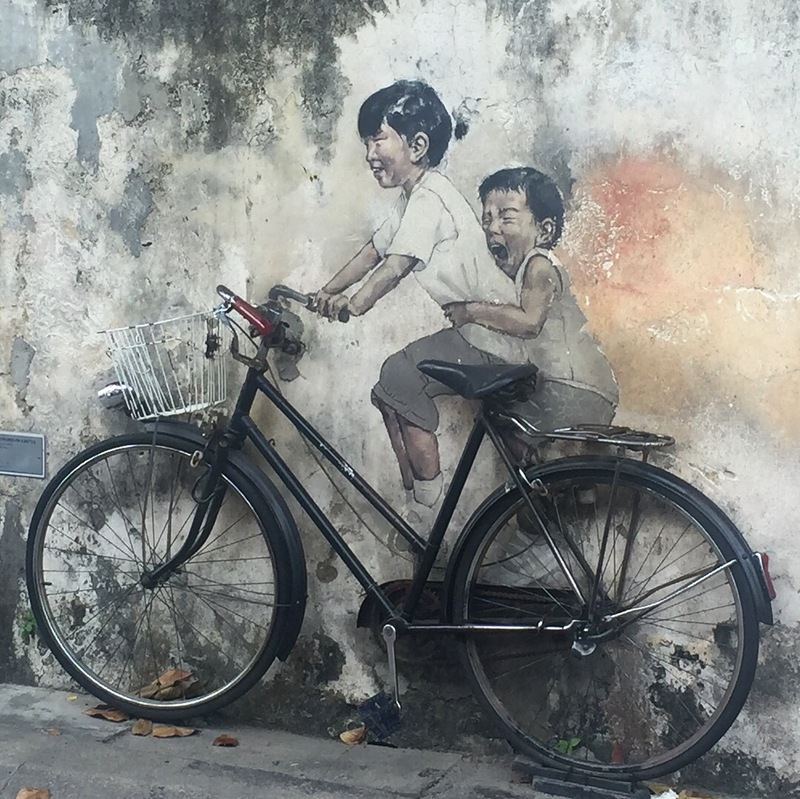 You can pretty much walk everywhere you need to in Georgetown and that’s encouraged as it’s full of history as well as what Penang is most famous for, good food and street art. 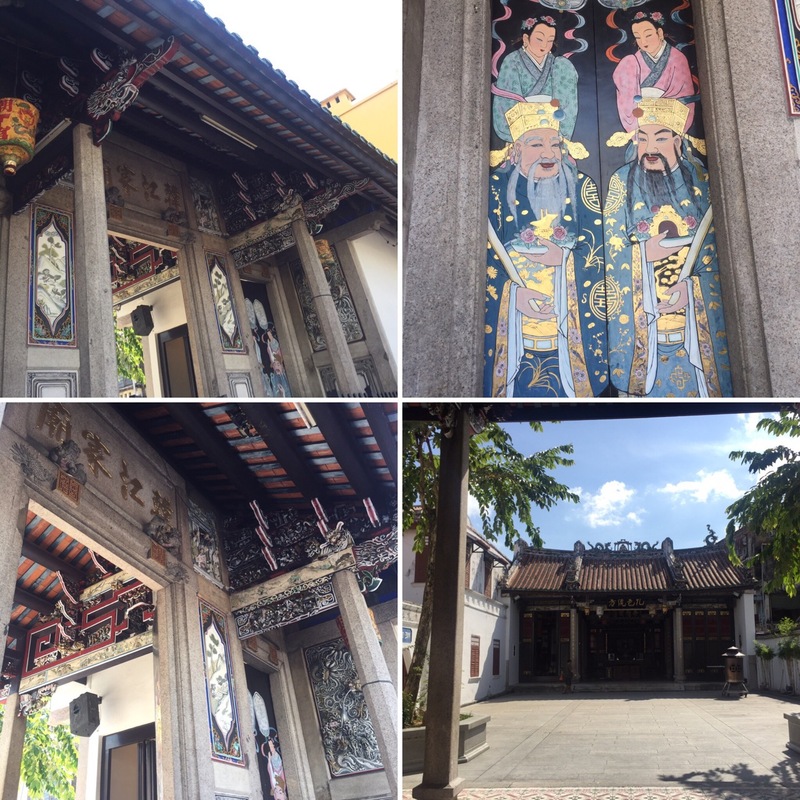 We started our time in Penang by loosely following the Harmony Street walking tour that you can find online. This leads you through the streets of Georgetown showing you the range of religious places of worship that all run alongside one another. A Hindu temple was next to a mosque which was opposite a Christian church etc. As Malaysia is officially a Muslim country, I hadn’t expected their to be so many different religions all having such dominance in the area. 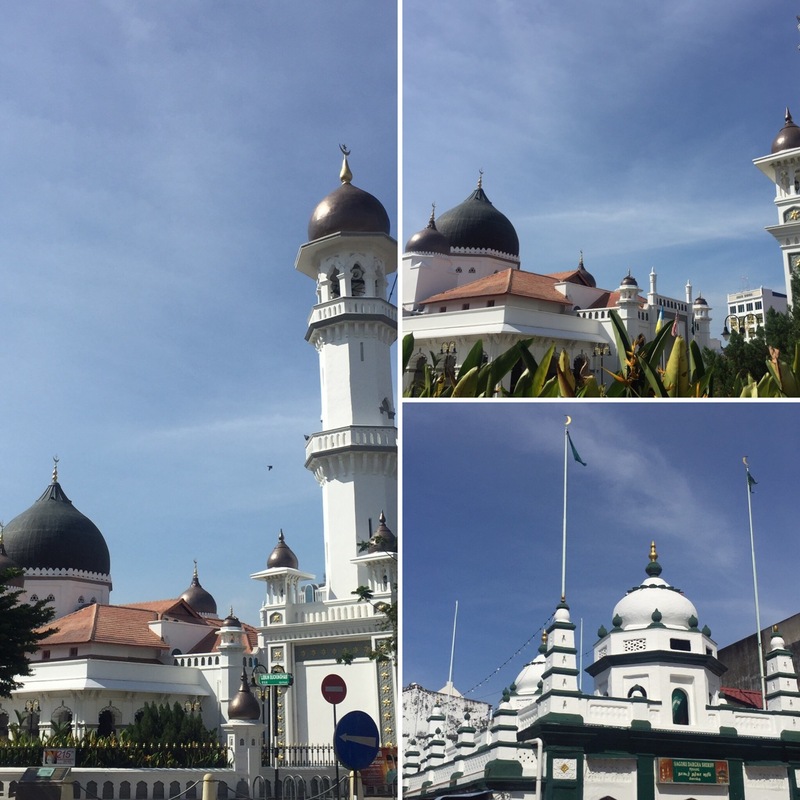 I read that Malaysia has it built into its laws to have freedom of religion and that was why, even way into the past, people were comfortable practising the religion they wanted to – I think that is really great. 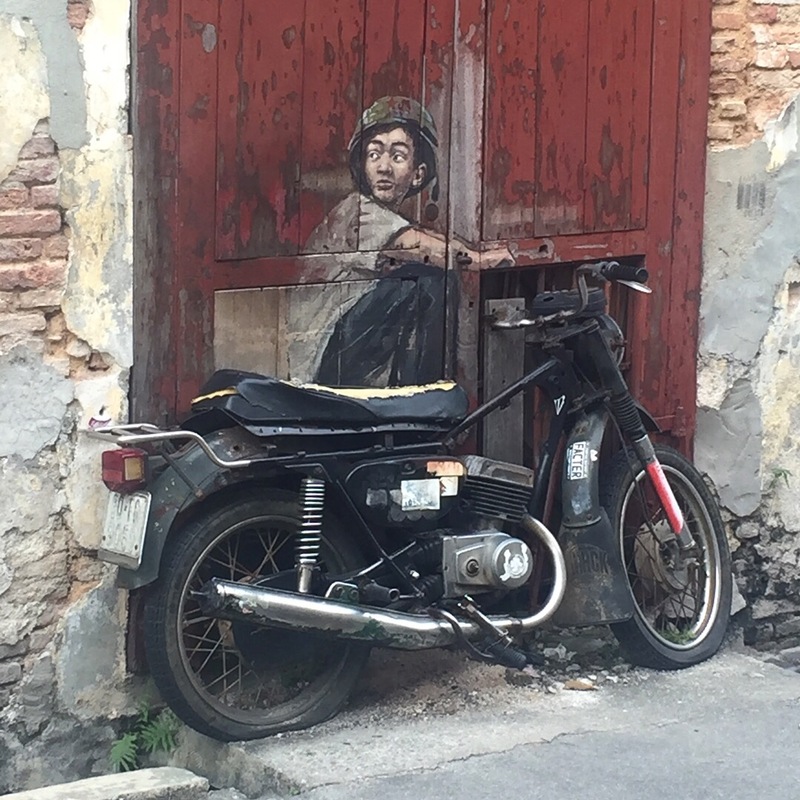 Later, after cooling off in our hostel for a while, we went on the hunt for the street art that is hidden throughout Georgetown. There are pictures everywhere, some quite easy to spot and others subtle on the side of an entrance way or down a little alley. We were also told by a local that people even have them in their houses to find but we didn’t try to find those ourselves! 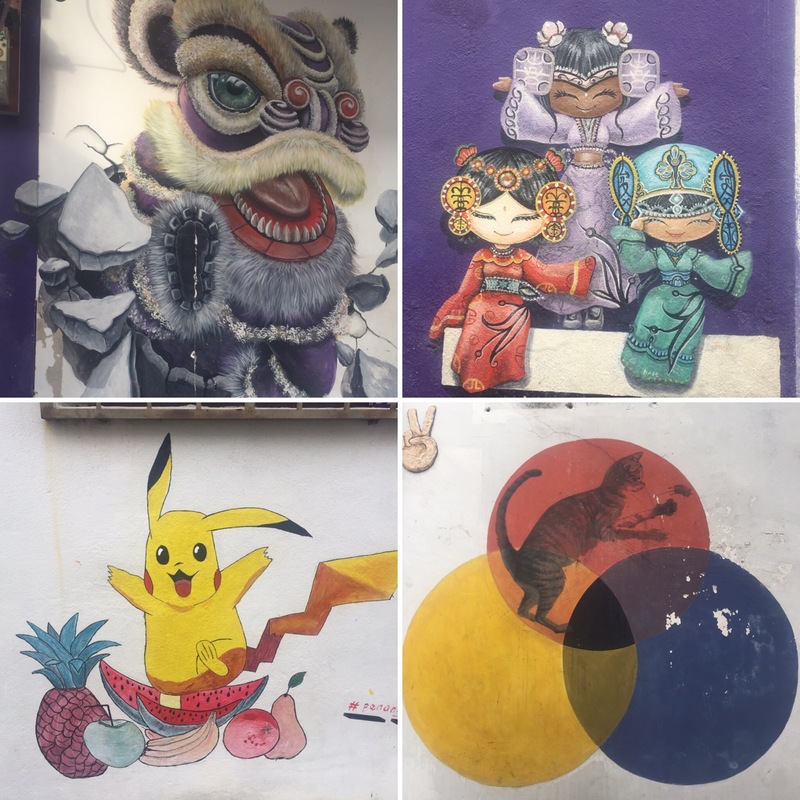 Looking for the street art was also a good way of exploring the city as it meant you wandered down random streets and it meant you found other cool things like street stalls or in our case, a giant Chinese parade! Our exploration of the street art led us onto Hong Kong street. This was very fortunate as it was packed with people all dressed in white and yellow and giant, decorated floats (like the ones you see on parades on tv) all covered in lights, glitter, dragons and deities. It took us a long time to work out what was happening but it was still great to be amongst the festivities and watch the parade take place. 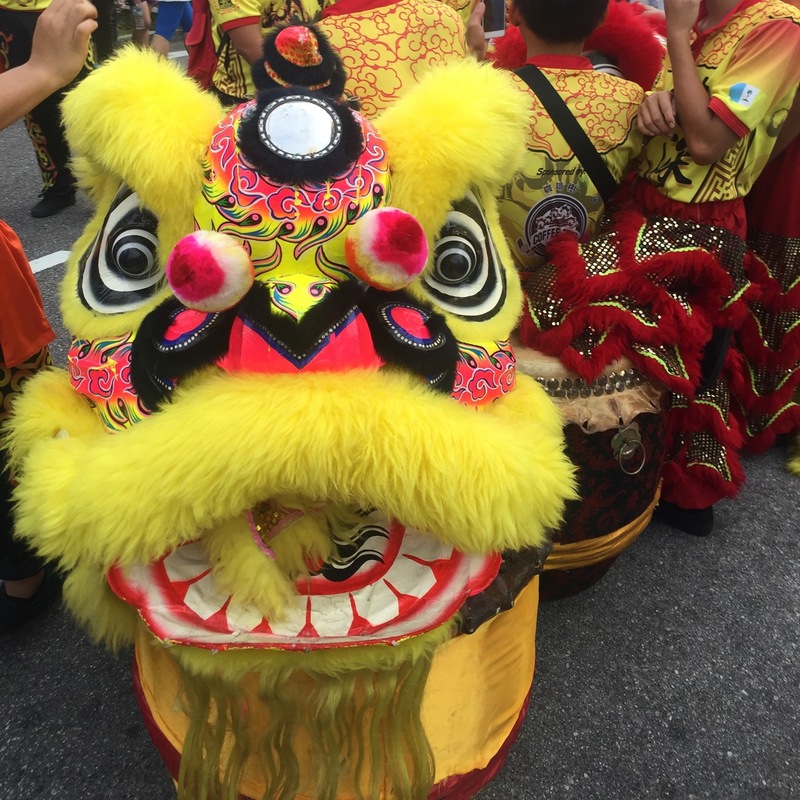 We got to see people try and balance an enormous Malaysian flag on their forehead, drummers and bands marched down the streets and, my favourite, Chinese dragons! It was amazing to see Chinese dragons in real life having only ever seen them in films and pictures before. I was so excited about it! It must be very tiring to play the part of the dragons particularly the rear end who was bent over most of the time! We later googled it and it turns out the festival happens every year and runs for nine days starting on the 20th October. 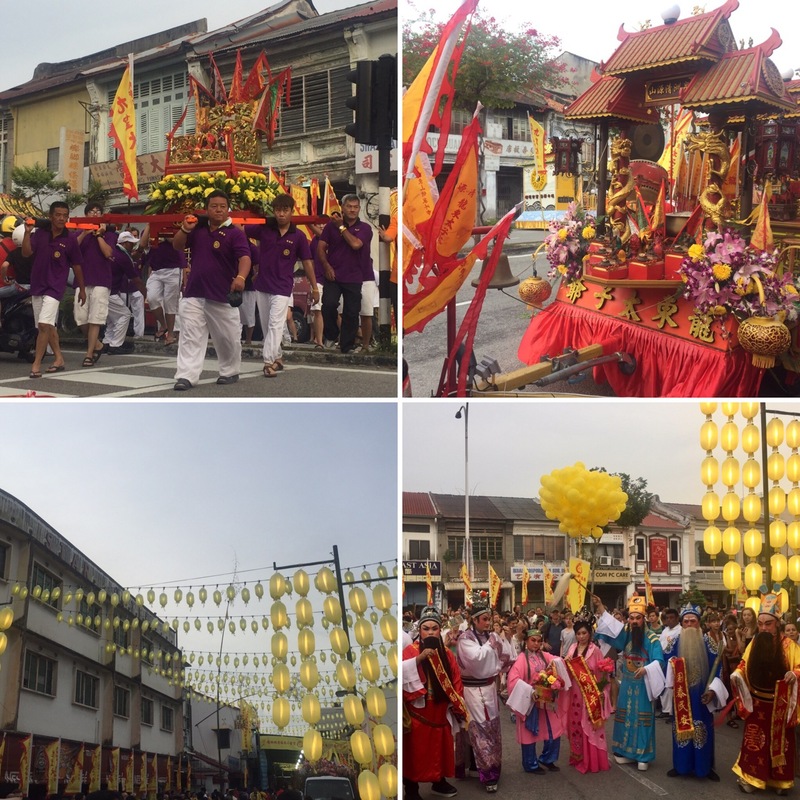 The focus is the Tow Boh Keong Temple on Hong Street Street where people come to pay their respects as part of the Kew Ong Yeah (Nine Emperor Gods) Festival. 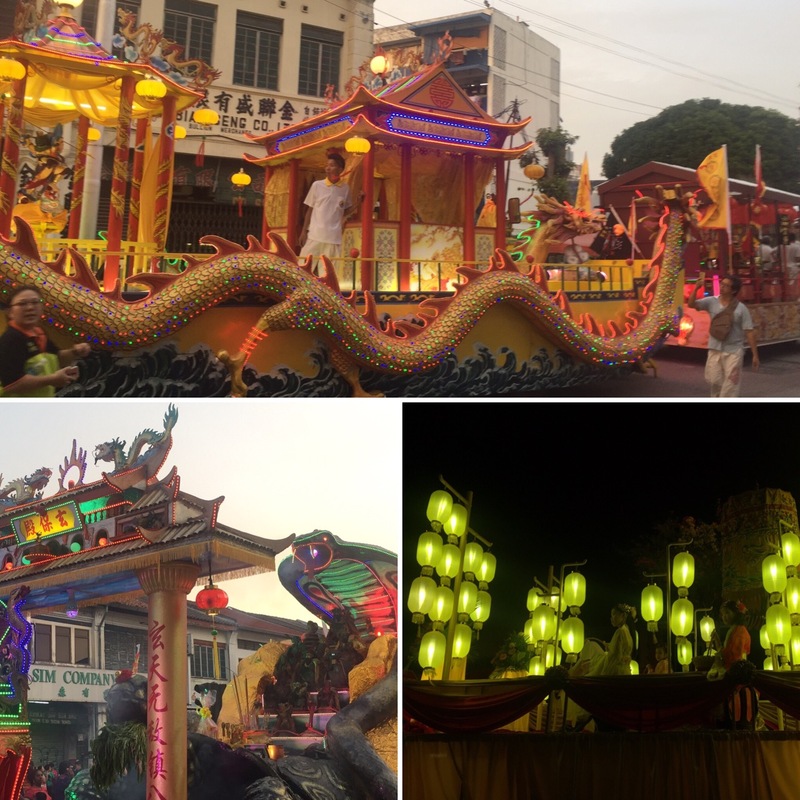 The string of floats we saw were part of a 93 float procession that does an 8km route around Hong Kong Street – we had never realised it was quite that big! It also said online that the year we saw it was the biggest they had done the festival so far so that makes us especially lucky to have been there to see it. In between seeing the procession of floats we ate at the Red Garden Food Paradise which did really good food. 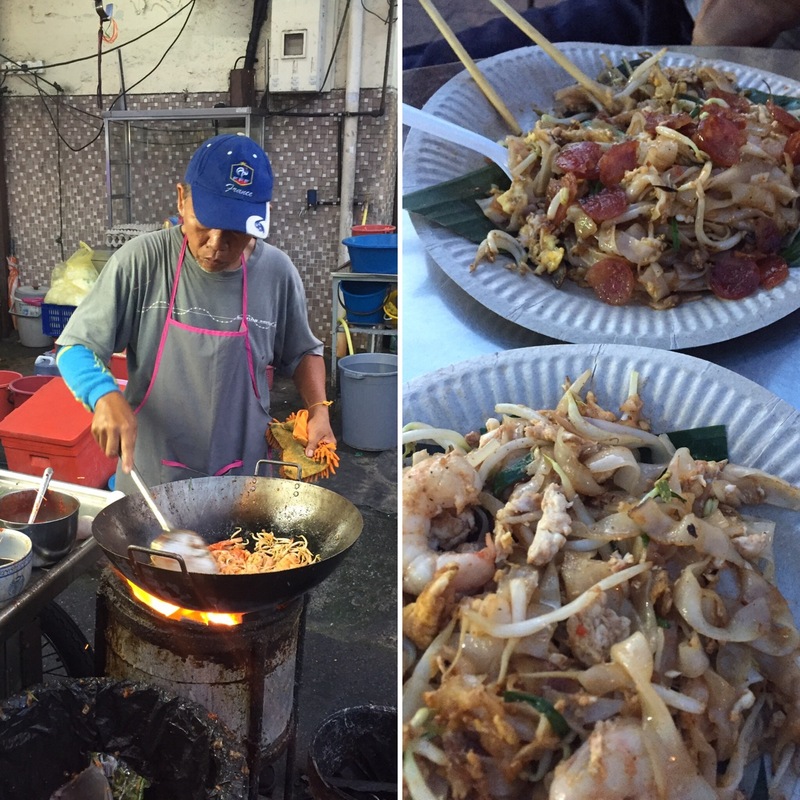 Niall got to try a popular local dish called Char Kway Teow (noodles, spice, vegetables, prawns and sausages) which he really liked. 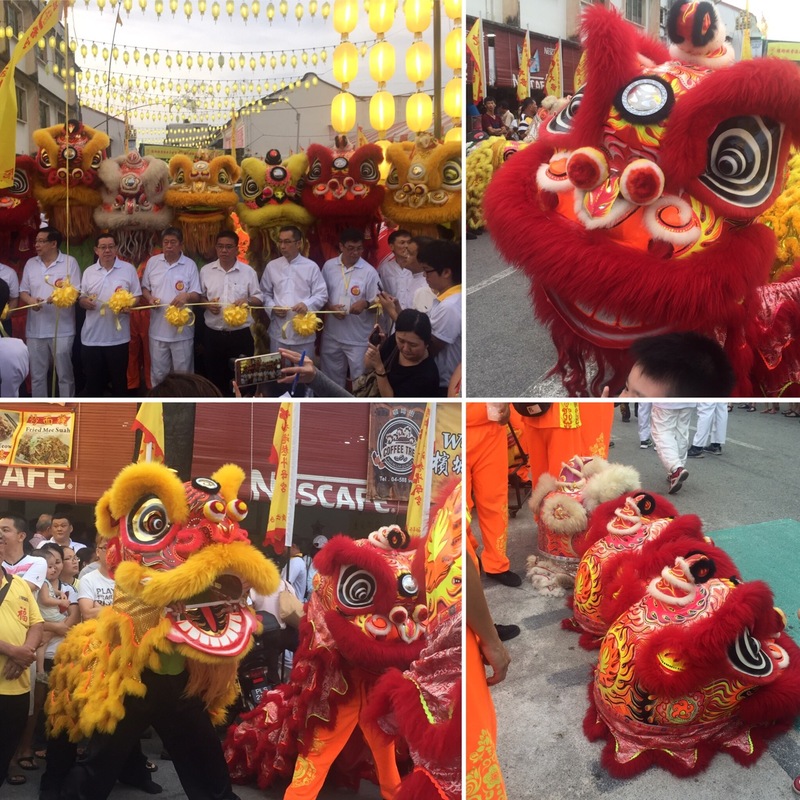 It had been a good first day in Penang getting to experience a real flavour for what this place had to offer. 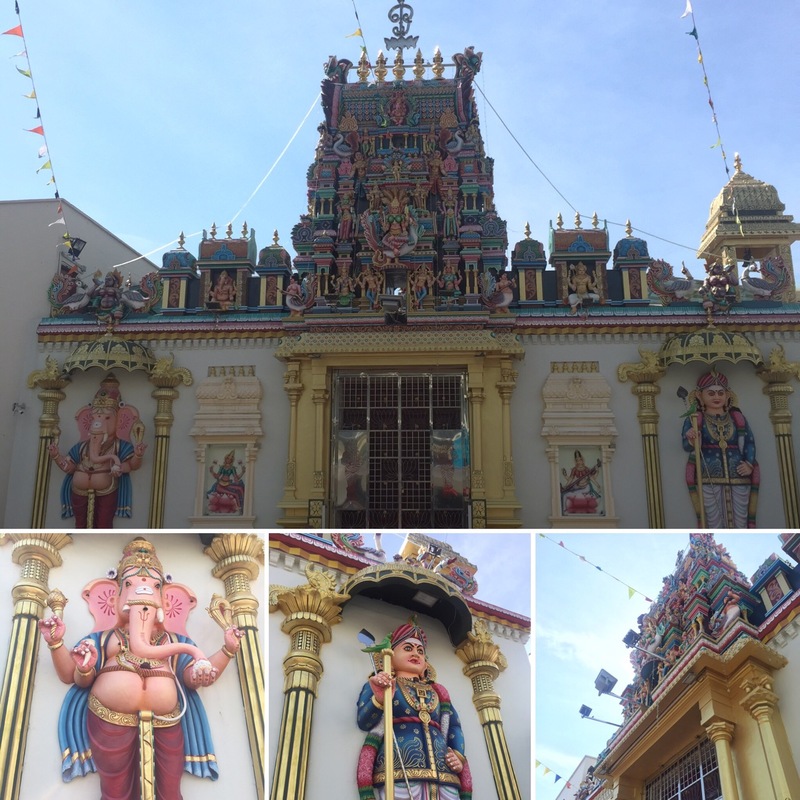 In our next day in Penang we decided to venture a little out of Georgetown to see more of the island. 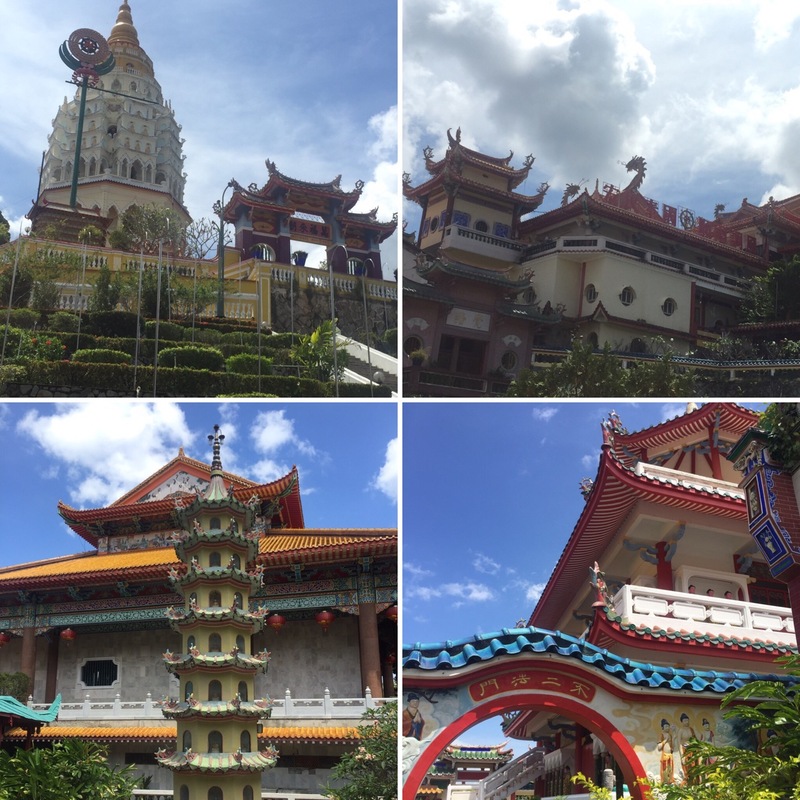 We first headed to the Kek Lok Si Temple which we had heard a lot about before coming to Penang. We had to get a bus there which took around an hour and then walk through a tunnel of stalls and steps up to the temple itself. The temple was really pretty! 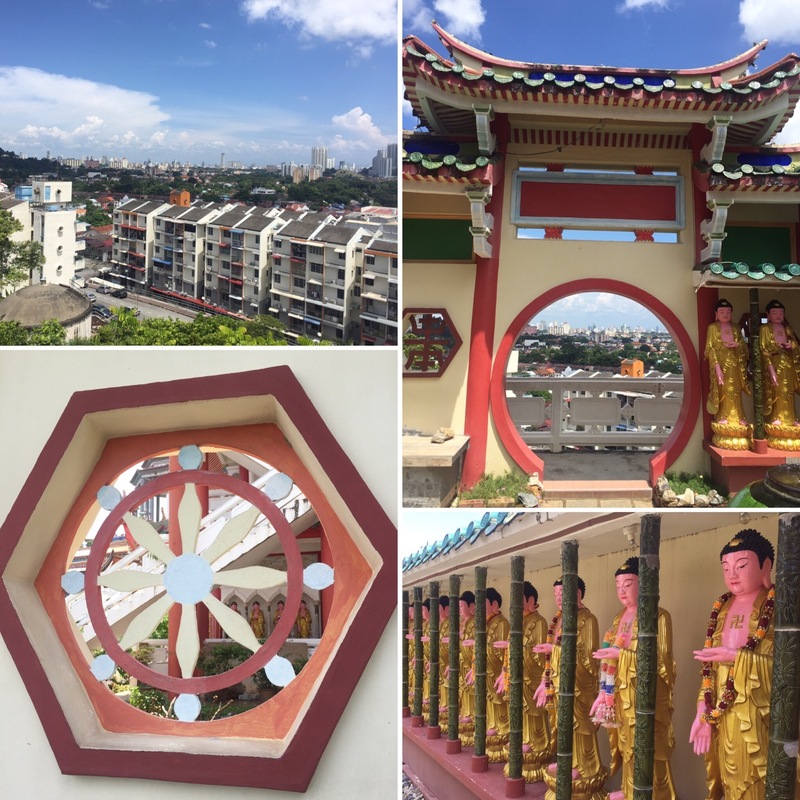 It looked over the surrounding area from its high vantage point on top of a hill and was covered in colourful patterns and pictures through the full complex. There were a range of different temples to go into on the site all with different designs and their own deities to worship. We really enjoyed looking round here. 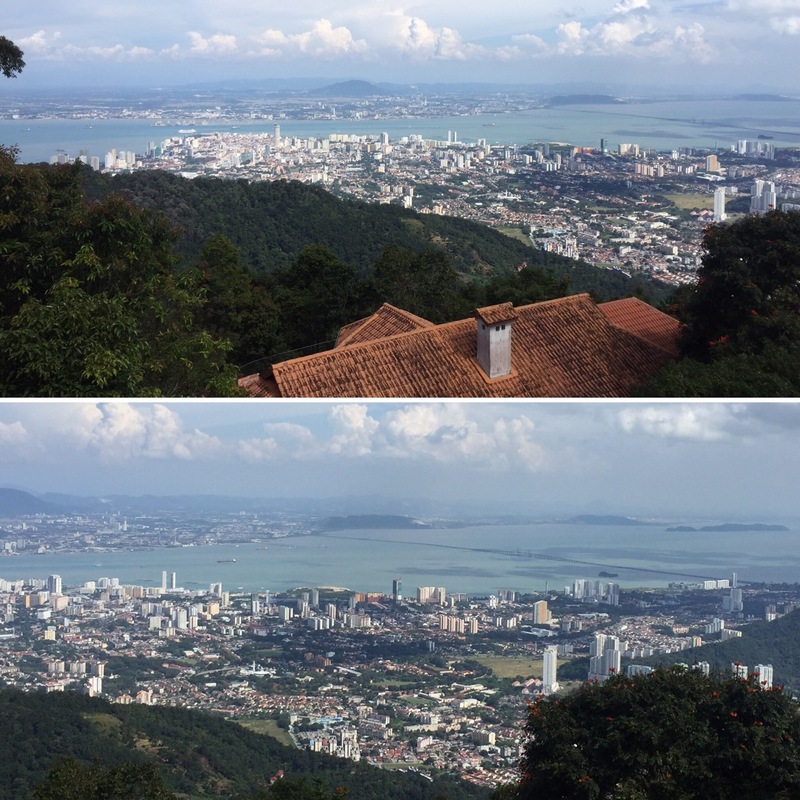 We then headed to Penang Hill which is the highest hill on the island and gives you a bit of a break from the heat! 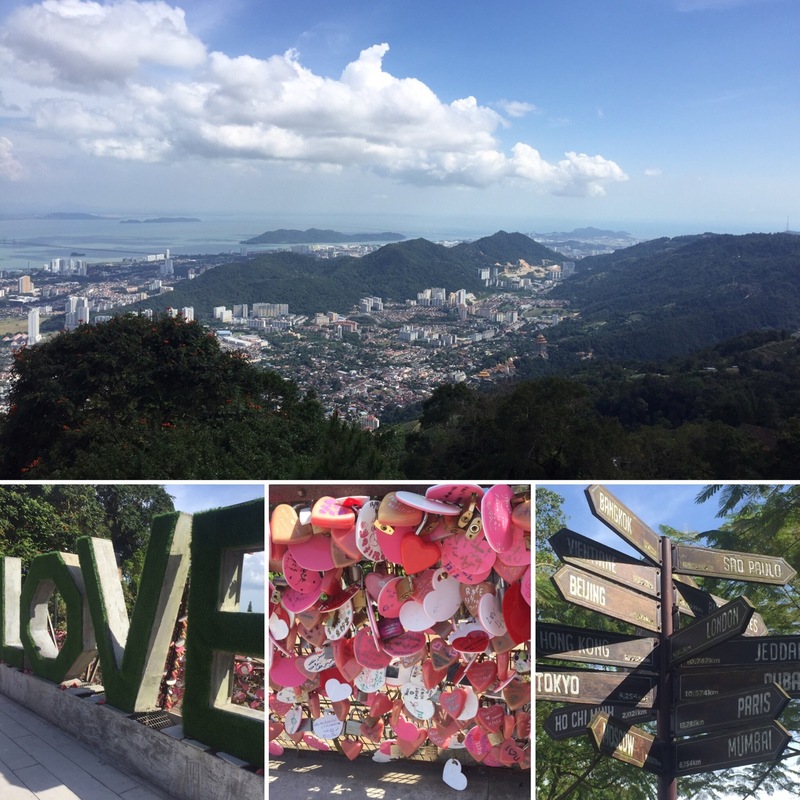 You get a cable car up to the top – you can walk it but it would take hours and it’s really hot in Malaysia so, for us, hiking is the last thing we want to do. They really pack people into the cable car and it goes pretty steep so if you’re not lucky enough to get a seat you have to hold on as you’re tilted the full way up. The views at the top are great and it’s a lovely temperature (more like English summer than a sauna). We spent a couple of hours up here just enjoying the view. There are also random ‘attractions’ at the top and, if you did want to do hiking, you can get up to the top and take a variety of walks to different parts of the hill where there would be cable cars to bring you the rest of the way down. 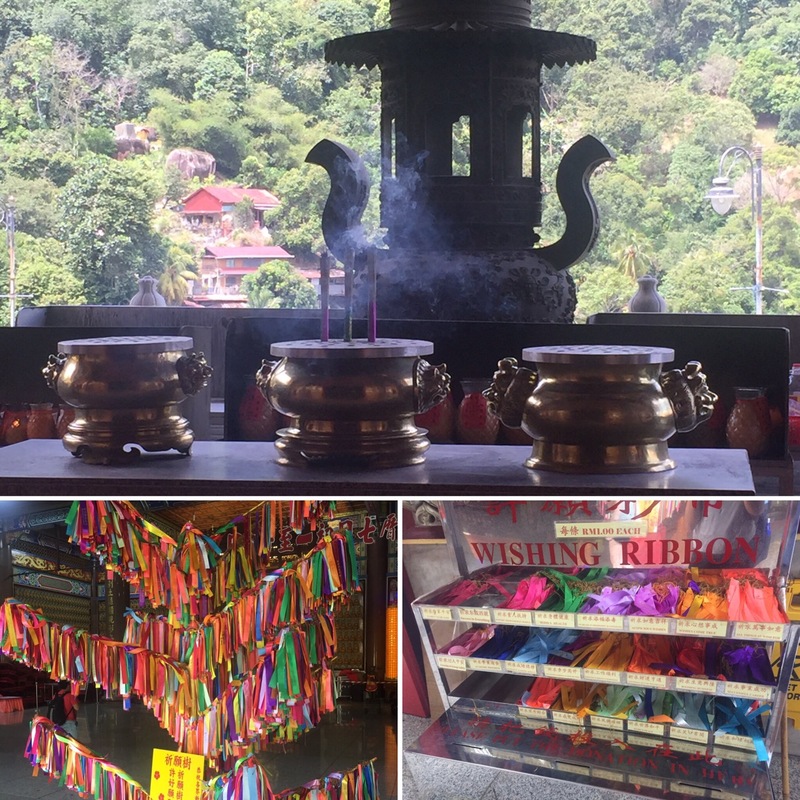 On our final day in Penang we spent the morning wandering around town before we headed to a couple of temples we had wanted to see. 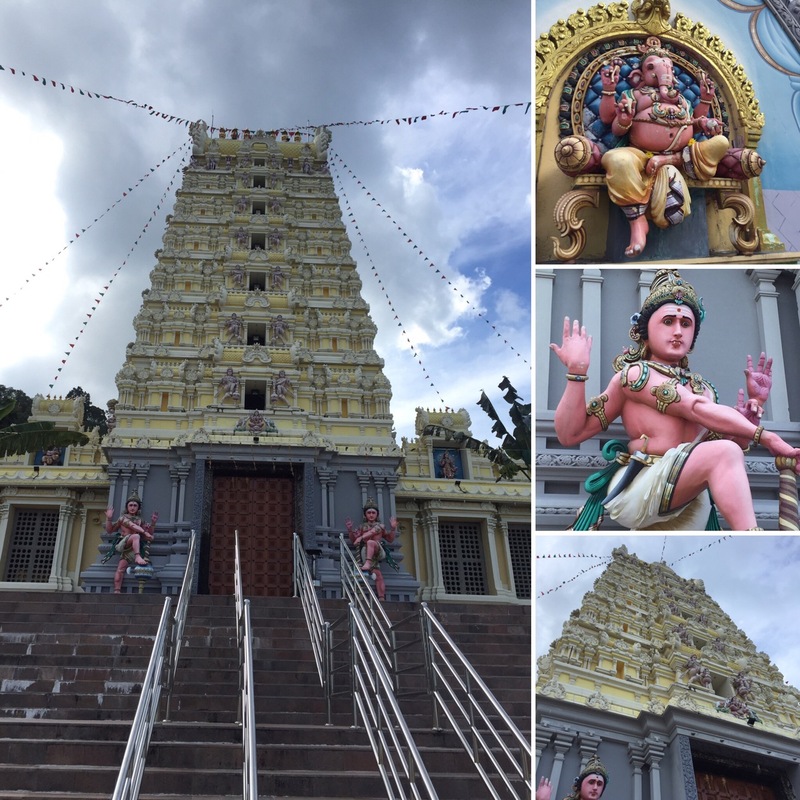 The first of these was the Balathandayuthapani Temple. This involves climbing 513 steps to the top but it actually didn’t seem that many considering all the steps we had already had to climb in Malaysia and the views from the top made it worth it. I also liked when climbing the stairs that they had little motivational quotes to keep you going, it was a nice touch. 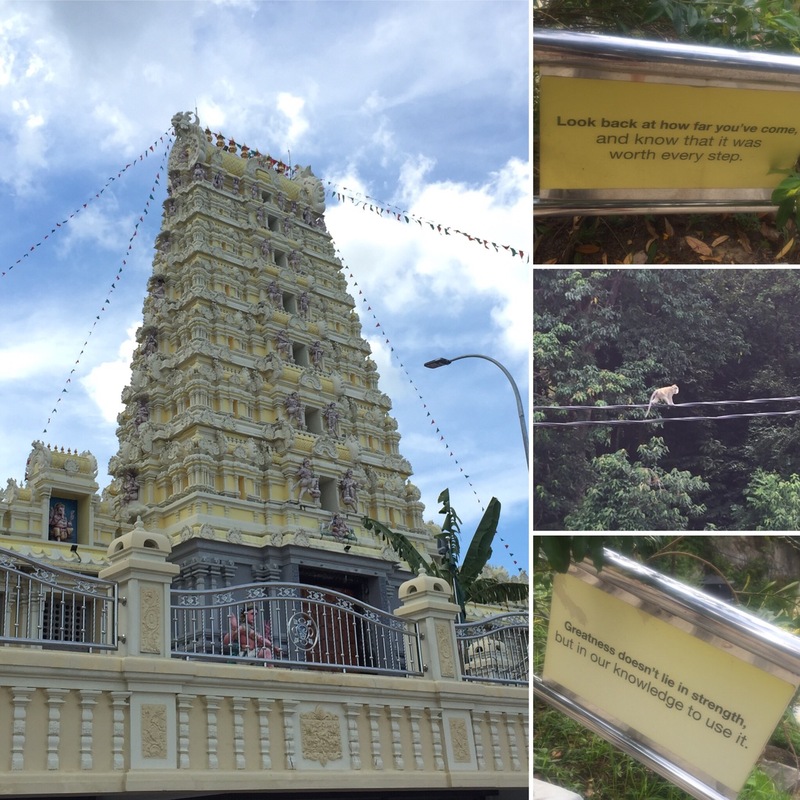 The temple is Hindu and focusses on the deity Murugan. The details on the roof of the temple were really intricate like we’ve seen on many of the temples in Malaysia and there were also a family of monkeys living at the top which provided us with some entertainment as they fought for food and the best sitting spot. 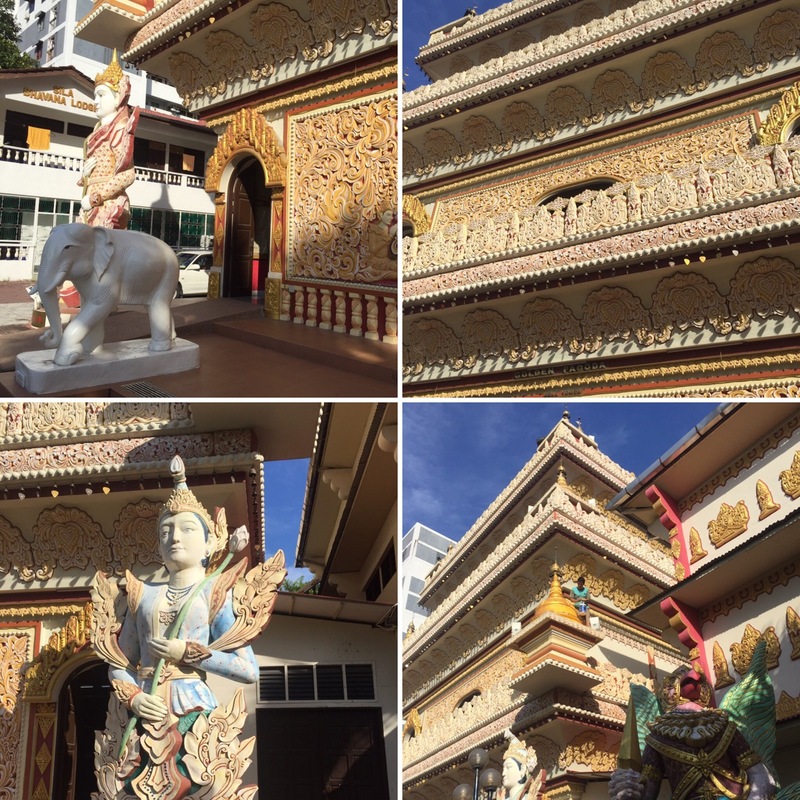 The next temple we went to see was around a 20 minute walk away and was called the Siamese Wat Chayamangkalaram Buddhist temple. 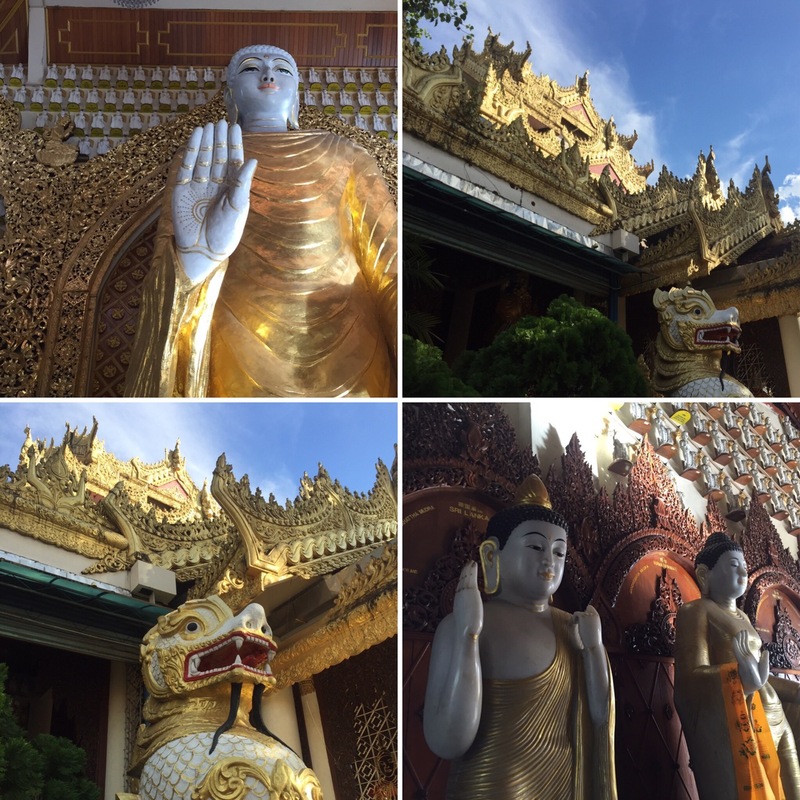 This is a Thai temple and is famous for the reclining Buddha that is the main focus inside. 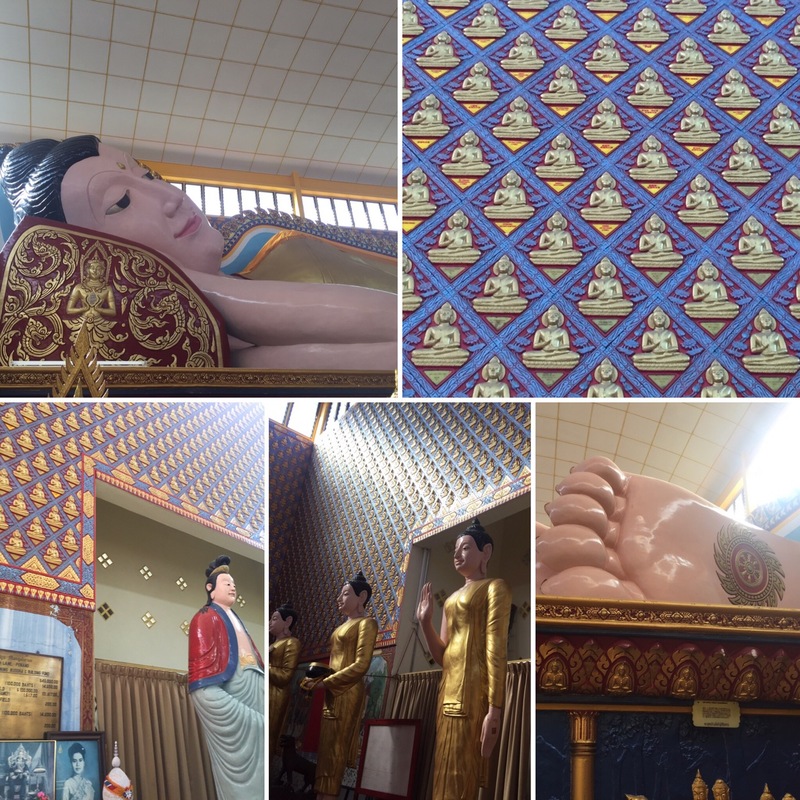 The Buddha is 180 feet long, gold plaited and is said to be one of the longest in the world. In all honesty, we weren’t super impressed. 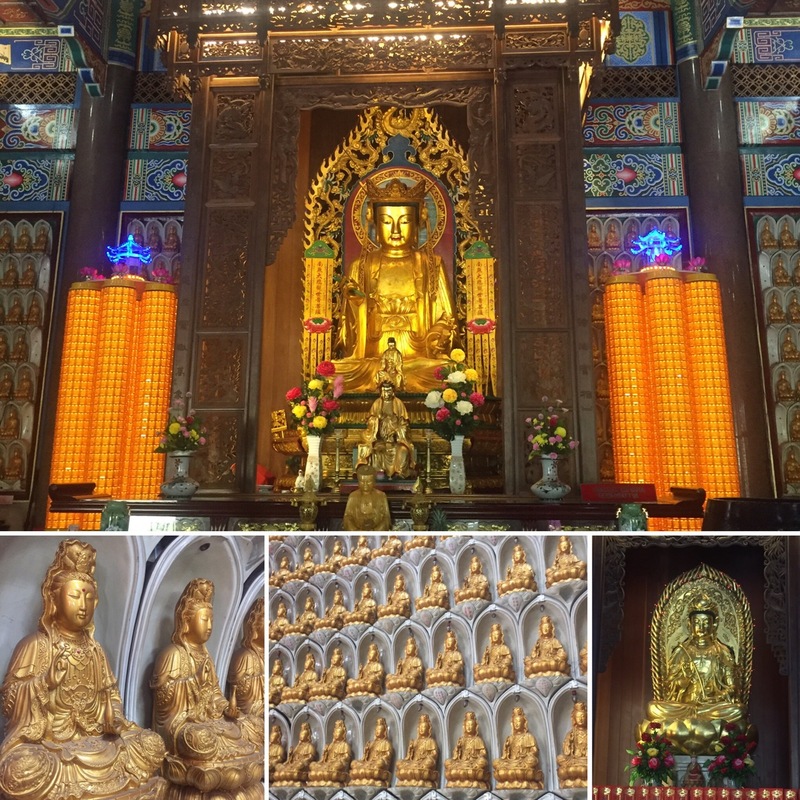 I don’t know whether the ‘modern’ design of the Buddha made it seem less impressive but I feel like we were expecting something a lot bigger considering it’s meant to be one of the biggest in the world. 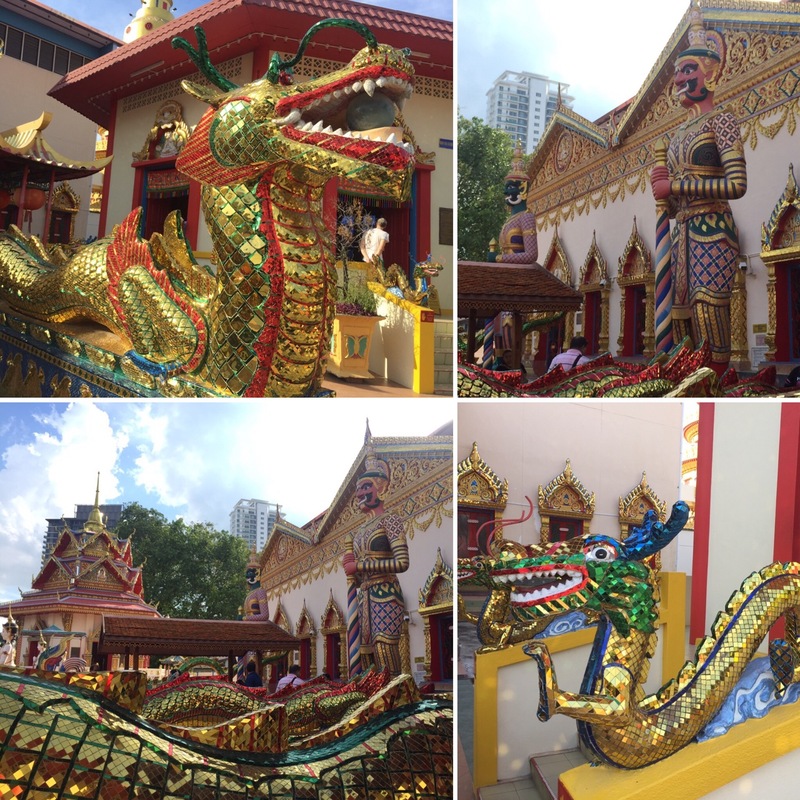 The building itself though is full of more intricate designs that we have seen in the different temples around Malaysia and it also has bright, glittery dragons guarding the entrance. Across the road from this temple was the Dharmikarama Burmese Temple which is the only Burmese Buddhist temple outside of Myanmar (Burma). We hadn’t actually known about this temple but we’re really glad we went to it as it was gorgeous. The walls were all covered in fine detailed swirls and patterns and there was an awful lot of gold everywhere. 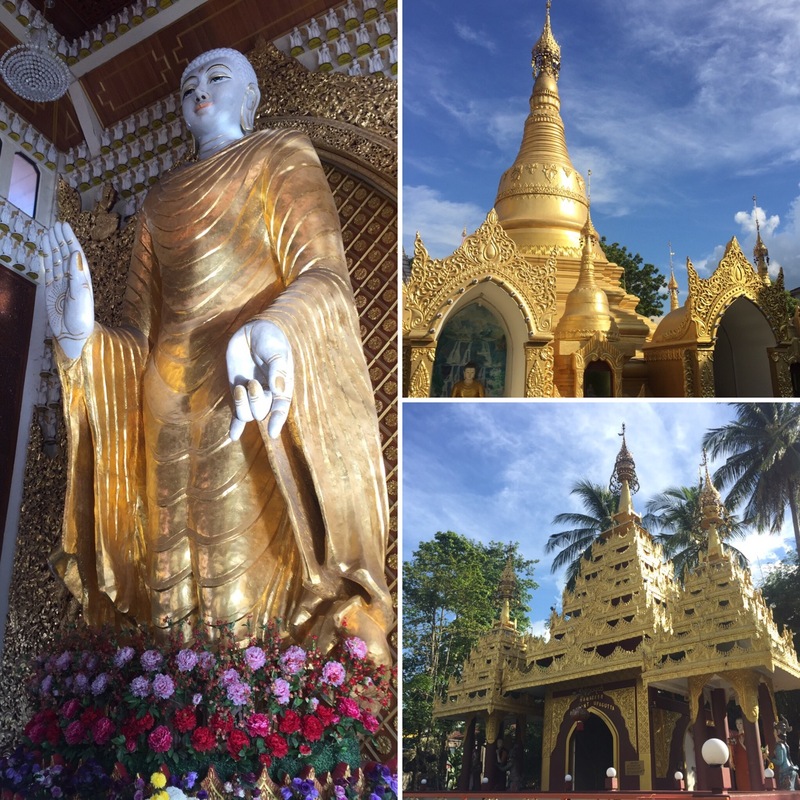 I think it was my favourite of the temples we visited and it made us excited for when we go to Myanmar to see all of the temples they have there. We ended our time in Penang at a street market which did a range of different foods often made by someone using a bin full of wood and a pot. It’s great to see them make such nice food with such simple equipment really, and the char kway teow we had (we had to have it again before leaving Penang) was very nice. 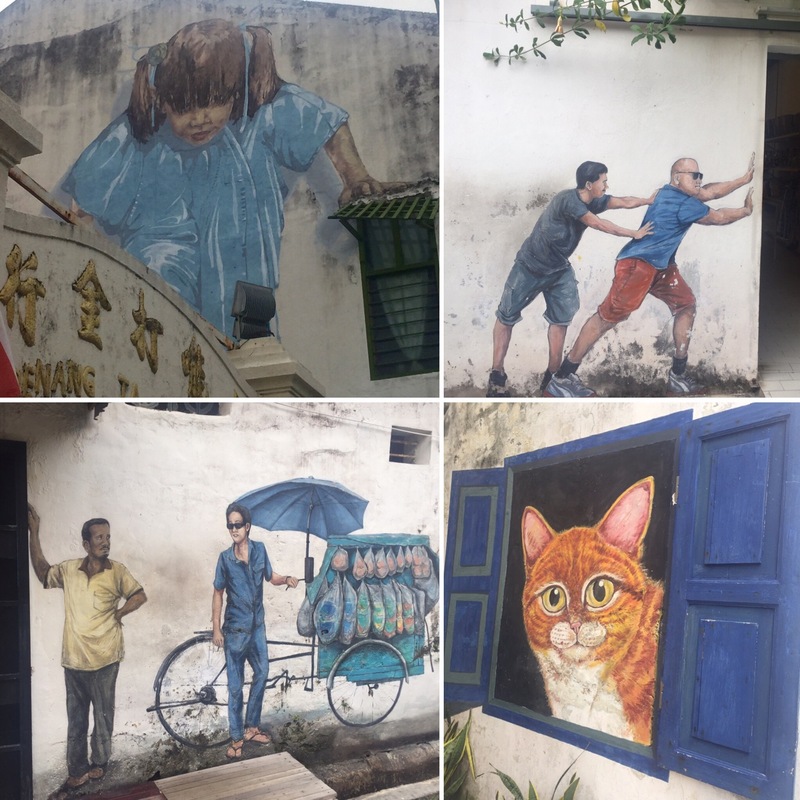 Penang has a lot more to offer than just the old town in Georgetown to the extent that even our busy days here we didn’t get everything done. There were even more temples we could have gone to see (although maybe you get a bit templed out then) and there is also an entire national park and beaches you could explore. 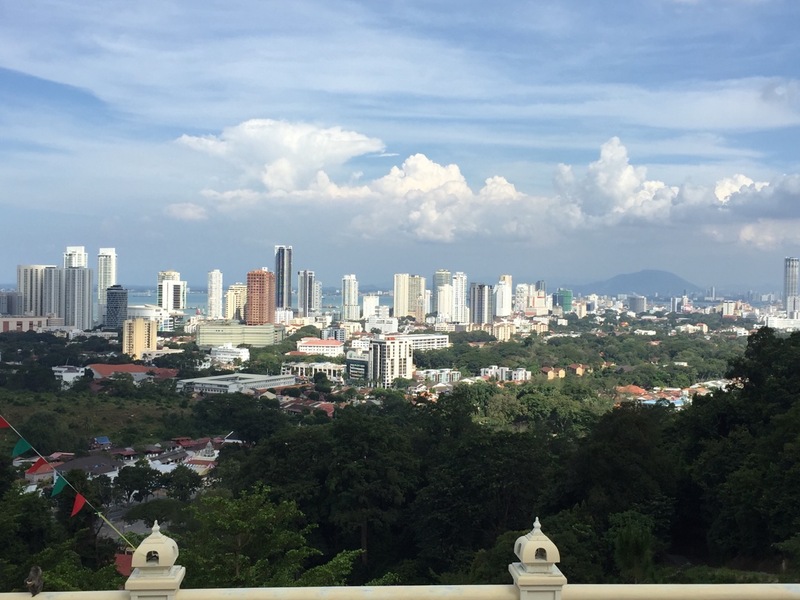 We liked Penang and are very glad we went there but, for us, we struggle staying somewhere for too long so it was time to move onto the next place in Malaysia: the Cameron Highlands.